High quality and food safety are the main core values of Al-Arz Ice Cream. We abide by our values throughout our manufacturing process, starting with the selection of raw material and the material used in packaging, until the final product is delivered to the market and sold to the end customers. 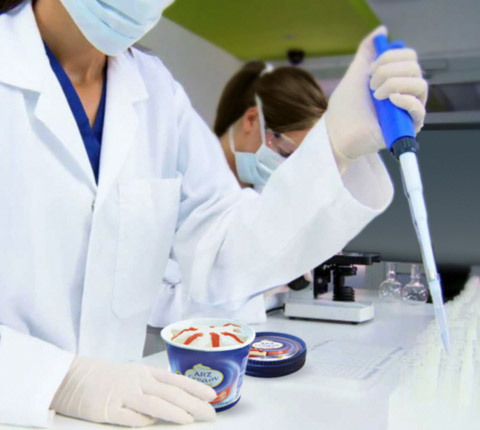 We keep a close eye on the production processes, where our high-tech quality assurance department and microbiology testing lab, in addition to external labs such as those of the Ministry of Health, carefully inspect all the products that will eventually be sold in the markets to guarantee their safety and maintain our high standards of manufacturing. Moreover, Al-Arz Ice Cream has always been in compliance with the local and international quality protocols and standards, where it has obtained the Palestinian Quality Standards (PSI) certificate in 2007, and the Hazards Analysis and Critical Control Points (HACCP) certificate in 2009 and is now in the process of acquiring the ISO22000 and FSSC22000 certificates.